It’s being reported that the newest version of Mac Flashback Trojan can now exploit Java engine in Mac OS X, all versions of Mac OS X I guess. It bypasses the administrator privilege protection, and so it can install itself onto any Mac machine with Java enabled without the need to use an administrator password. As now, Apple has yet to release a security fix to counteract Mac Flashback Trojan’s Java exploit, therefore I think it’s best for you to disable Java plugin for your browsers! 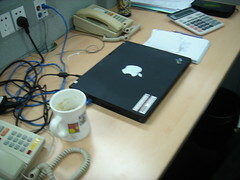 Should you disable Java on Mac altogether? Yes, but unfortunately Java is so interconnected with Mac OS X (all versions), therefore I do not yet know how to disable Java on Mac. If you know, please write a comment or two and share your knowledge with my blog’s readers. Anyhow, the easy quick fix for now is not to use Java in any browser that you use on Mac. Safari – disable Java, you need to go to Safari > Preferences > Security > and uncheck the box that says Enable Java. Firefox – disable Java, you need to go to Tools > Add-ons > Plugins > and disable the Java Applet Plug-in plugin. Chrome – disable Java, you need to type in about:plugins in the browser address bar and disable the Java plugin. Opera – disable Java, you need to go to Tools > Advanced > Plug-Ins > and disable the Java Applet Plug-in. Some of you might not know that you can add and delete users in Chrome browser. Chrome browser lets you add and delete users once you signed into Chrome browser with a Google account. 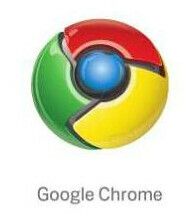 This particular feature allows you to share Chrome browser with another user who uses your computer, but this user doesn’t necessary use different Google account. So, in a way, by using different users with the same Google account, each user can store different browser history and bookmarks. Anyhow, I’d created a video on how to add and delete users in Chrome browser, and you can check it out right after the break! Update: For your information, once you had deleted the main user in Chrome browser, you will be logged out of your Google account entirely! This will not affect your Google account anyway, but just that Chrome browser will not remember your Google account. Also, extensions will be deleted if a main user (i.e., user which ties to Google account) gets deleted. I don’t want to repeat what others have already wrote about the release of Firefox 8 today! I just want to emphasize that Firefox 8 is safer for users, but will be a pain for some application developers. I’m not sure if that even sounds about right, because some web developers might not care. Nonetheless, it’s good to know that users don’t have to worry how certain third party software they install onto their computers might automatically install toolbars and extra Firefox extensions without the knowledge of the users, because Firefox 8 will notify the users if they want to allow third party software’s extensions or toolbars to be added to their Firefox browser or not. Mac OS X Lion’s users might be disappointed with Firefox 8 in one aspect. It is that Firefox 8 isn’t yet added an easy button to allow full screen mode. Unlike Firefox 8, Google’s Chrome 15 has visibly displayed two slant arrow heads button (i.e., one arrow head slants up and the other slants down) at the uppermost right corner so when users hit on it, Google’s Chrome will go into full screen mode instantly. Of course, users can go into full screen mode with Firefox 8 on Mac OS X Lion by go to View > Enter Full Screen or using shortcut keys, but somehow it seems these methods are somewhat cumbersome. In case non-mac users have no idea, full screen mode isn’t a big deal to Windows at the moment, but this feature is a big deal for Mac OS X Lion. Aurora is version 9 of Firefox. Firefox’s stable version is 7.0.1, and it already has a beta in progress which is Firefox version 8. What after Aurora? Well, there is a nightly built which has been bumped to version 10 of Firefox. Confuse yet? Don’t be, because if you’re a regular user of Firefox who only wants to play with the stablest version there is of Firefox, then Firefox version 7.0.1 will be perfect. Aurora carries a new feature known as Data Management Window, and this feature allows users to specifically assign which websites can access users’ information such as browsing data, cookies, passwords, and so on. 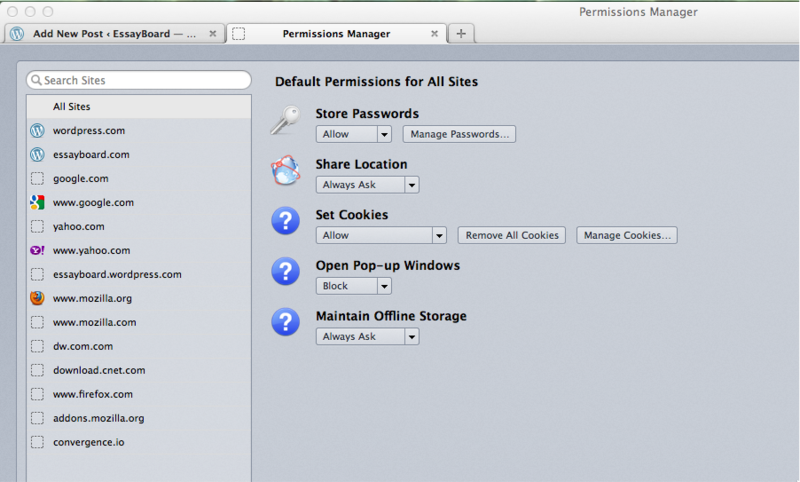 To access this feature, one has to type about:permissions into the URL address bar. 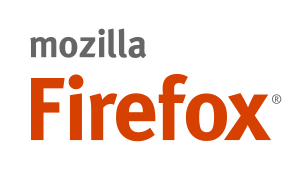 For web developers, Firefox Aurora comes with better support for HTML5, DOM level 3, server-sent events, networking technologies, and tools such as Scratchpad, Web Console, Web Developer Menu and others. Aurora supports Mac, Windows, and Android. I’m not sure if Aurora is available for Linux or not, because I’d not heard anything of Aurora and Linux. Nonetheless, I might update this post on Aurora and Linux compatibility when I’ve the chance to test Aurora out on Linux. I don’t have an Android device, therefore I can only repeat what the source says about Aurora on Android. The source says that Android users will have a new look and feel of Firefox through Aurora. I guess the only way to find that out for Android users is to download Aurora and test it out. $5000 Question, What About Amazon Mobile Silk Browser’s Privacy? Amazon introduces mobile web browser Silk to Kindle Fire and claims that this browser will be the first to use the power of the cloud servers to speed up the loading of mobile contents and improve the performances overall. It sounds great and all, but if Amazon’s intention is to make its cloud servers as proxy/caching sorts of service, then would one has to sacrifice some major privacy in term of web browsing? For an instance, if one wants to browse anywhere on the web using Silk browser, it’s obviously that Amazon will definitely know one’s favorite web locations, first ever visited web locations, and so on? Amazon can use these data then to attract users to all sorts of advertisements and products. Although one has to worry about privacy, but then one might like to trade privacy for security. In my opinion, Amazon definitely can improve the security of web browsing for Silk browser, because Amazon’s cloud servers are the powerful middleman that caches and processes and optimizes contents for users before the optimizations of everything get push through Amazon’s network and back onto users’ Kindle Fire. To make this clearer, Amazon can intercept everything and then make sure that everything is safe before passing on to the customers — example would be scanning a piece of contents for viruses and malware before a customer download it. $5000 question is that will customer sacrifice privacy for security and performances? Anyhow, check out the video right after the break to know more of the mechanics of Amazon’s Silk browser. Just a slight improvement to Firefox 5, Firefox 6 wil officially be released on Tuesday. The official release isn’t going to stop Mozilla to release the final code today through its FTP server. You can try to look up for Mozilla FTP server somehow and download Firefox 6 before the official release of Firefox 6 comes out tomorrow.